Do you have photo albums un-touched in years? Is there a box of pictures stashed away that hasn’t seen the light of day in ages? What treasures may be hidden in your attic or basement? After our Big Move August 9, more of Cliff’s artwork has come to light, pieces squirreled away, forgotten for decades. Cliff found a treasure trove of surprises in an armoire’s shallow shelf with other large art pieces, in niches below that, in a handmade folding portfolio, and in a cabinet with glass shelves. An antique mahogany cabinet brought forth more surprises. Cliff and Barry Beitzel, both divinity students in college, studied Greek together. Cliff became an artist/educator and Barry, a Hebrew scholar and author of important biblical literature including The New Moody Atlas of the Bible. Yes, time moves on. 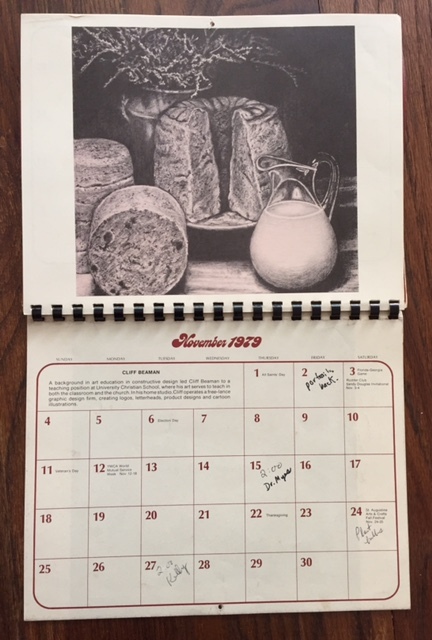 More than thirty-seven years have passed since this calendar with Cliff’s pastiche drawing circulated for the new year. Maybe it’s time to check through memories marinating on your shelves, incubating in boxes. No telling what treasures you’ll find. Any I missed? Please add others in the comments column. Thank you! But there is no way I’ll find the type of treasures-artistic treasures-that you both have discovered . These paintings and drawings are incredible. I am so enjoying looking at them through your blog. And thank you for sharing them! See? A change, a move, is always for the good. Yes, we knew a bunch of stuff was there – but we couldn’t pinpoint exactly what. And yes, a move does stir things up. You are up early today, Pamela. Thanks for being the first responder today. 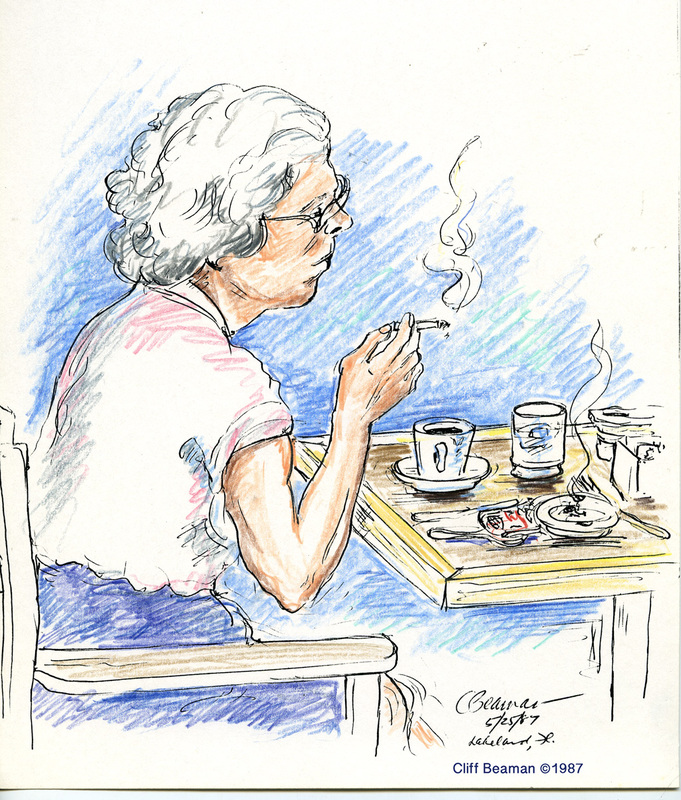 I enjoyed seeing Cliff’s art, especially the unsuspecting diners. 🙂 I would tell stories about them in words, but he can do it through pictures. About a year ago, I was cleaning out a bag that held thank you cards written to me by older daughter’s classmates when they were in 4th grade. (I came in and did a little history talk for their Social Studies class.) As for photos–yes, we have drawers full that never even made it to albums. 🙂 And I have some that I took from my mom, too, that still need to be organized. . .
Actually, I can imagine you writing a flash fiction piece on one of the diners, Merril. Good morning. It has to be exciting to have a husband with this great gift to see the world and put it on canvas. I remember the picture of the house on Anchor road and how mom and dad loved it. All the pictures that you post that Cliff draws for your post and his classes. The places you have traveled with him you both compliment each other with everything you accomplished. Thank you for sharing these with all of us. Your children and grandchildren have a great blessing and legacy. Thank you have a nice day. You are right, Gloria, these photos are a record of our legacy, posted with the hope that others will preserve their own photos, clippings, and pictures however that can best happen: in albums, in scrapbooks, . . . Come to think of it – a good project for your grandchildren, especially during your long Illinois winters. Ha! That would be a great project for them. They love the snow go out to hill sledding. Their out more in winter than summer. I always have to throw them out. Lol. This year we will be busy in restaurant. They all have To be there. How hope your restaurant is thriving. What a family project. I’d like to know more – when you have time, Gloria! Wow! Talk about treasures! Cliff’s artwork is amazing, Marian. 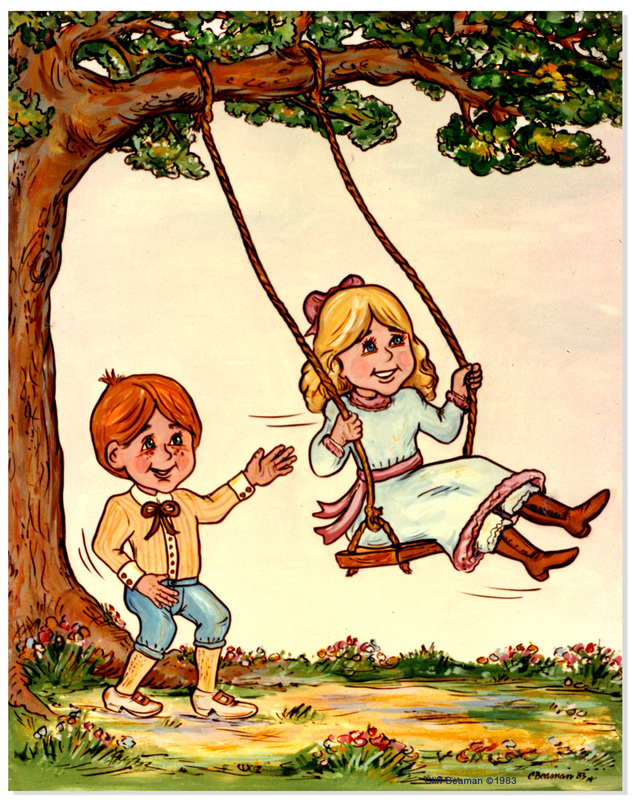 My favorites are the dogs and the children on the swing…they made me smile. Thanks for sharing! 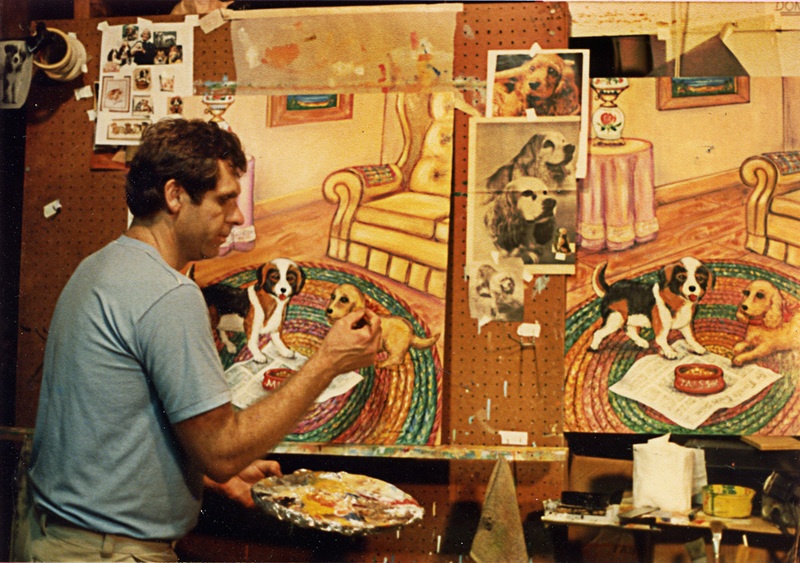 These photos are actually paintings that hung on the walls of Wolfson Children’s Hospital here in Jacksonville during the 1980s and 90s. The idea was to make the children smile. I’m glad they had a similar effect on you. 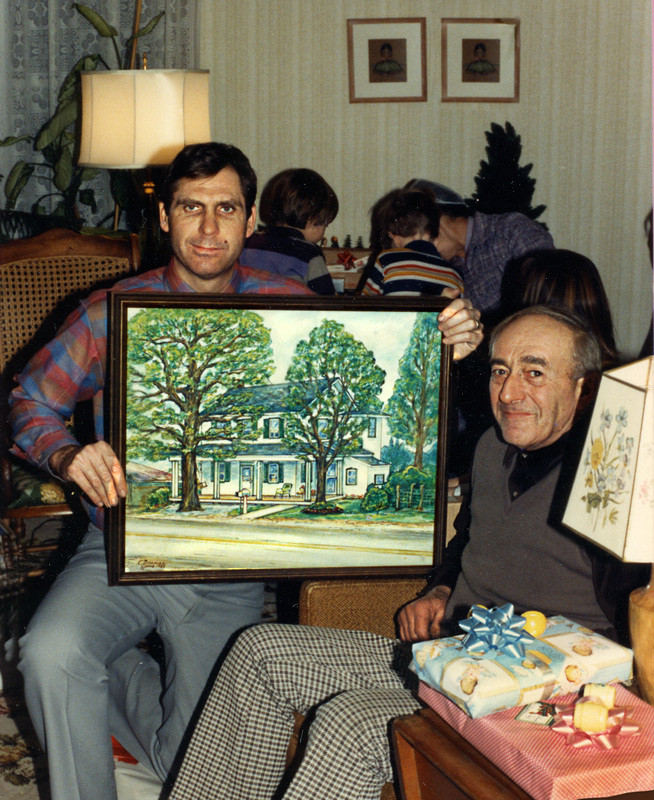 In the ‘homestead painting’ I see pride in Daddy’s eyes for his artist son-in-law. Sub-title – Wow….maybe this guy can make a living in the art world! Thanks for the nod here, Jean. You can picture the house, Daddy, Cliff, and all in real life oh so long ago! The subtitle? Very appropriate. Oh, Marian new, what a marvellous surprise that must have been and aren’t those paintings and drawings just superb! Cliff is certainly a very accomplished artist and I love his style. Thanks for the update here and the sweet Tweet. It’s hard to travel well with a lot of baggage, that’s for sure! How fortuitous your post! I have just begun going through boxes of 35mm slides starting from the 60’s when I got my first SLR camera, an Exacta second hand with the advice of Elton Moshier (remember him from LMHS days?). My intent is to digitize them but I will sort through them first to weed out the poor exposures and duplicates. I found a few to share with you when all are sorted out and on my computer. Oh, Verna, I do remember Elton Moshier (fondly) and recall you were into more advanced photography earlier than I was. Some of your LMS slides and photos have been featured here – very pleased about that. I’ll anticipate more after the sorting. Thanks for appearing here with your nostalgic comment, Verna. Cliff is a talented artist and these findings prove it! How wonderful that the move prompted good memories for both of you. I love his note to himself. Thanks for sharing! Cliff didn’t initiate the idea of moving, but he certainly got on the band-wagon in time to get piles of stuff (I’ll rename them treasures) boxed up for the movers. He wrote this memo a few weeks after we had moved, the dust settled, and he got a chance to do some sorting so he can digitize prints and photos. I’ll make sure he sees your comment – thank you, Darlene! 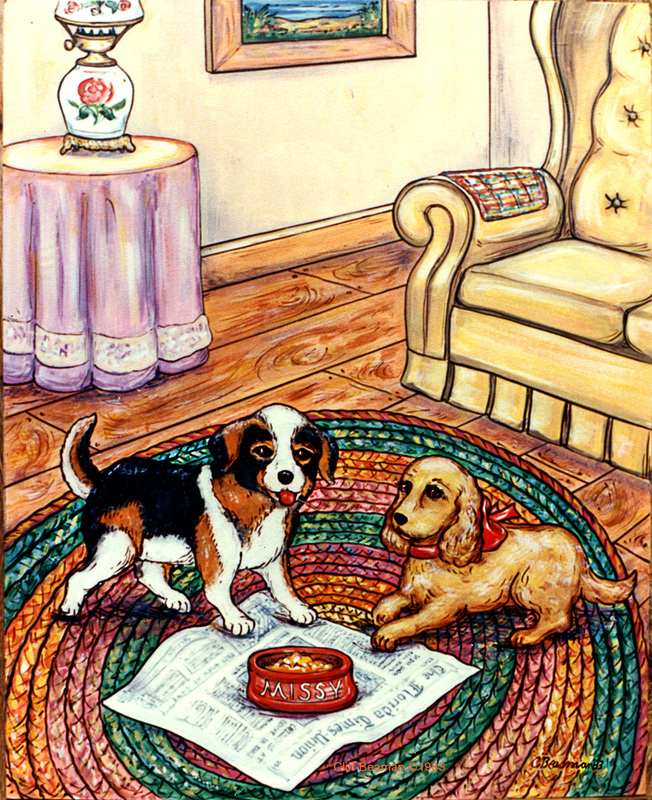 I have not forgotten that he contacted me about the possibility of illustrating one of my books. You never know! Right indeed, you never know! This was great fun to read through, Marian. And seeing Cliff’s pictures reminded me he and I must talk again about my children’s book! Soon. You asked if any of us had this sort of cache. Well, I have two. I have “my grandmother’s suitcase” which contains many of the letters I wrote her as a child. That will wait until I know I can get into it and come out with a book. AND, just last year my former husband passed along to me the gigantic storage box of the photos of my kids growing up. I’ve been sorting through them from time to time and scanning some into digital form. So far, though, no whimsy of the sort you’ve uncovered. May you and Cliff continue to uncover such gems. You have connections to publishing, so I have no doubt your intent will come true, Janet. What a treasure trove you have discovered in your Big Move, Marian! I thoroughly enjoyed viewing Cliff’s multi-talented artwork. Now that you have uncovered all these gems, I’m wondering what you will do with them. You’ll need a new home to display them all (just kidding!). 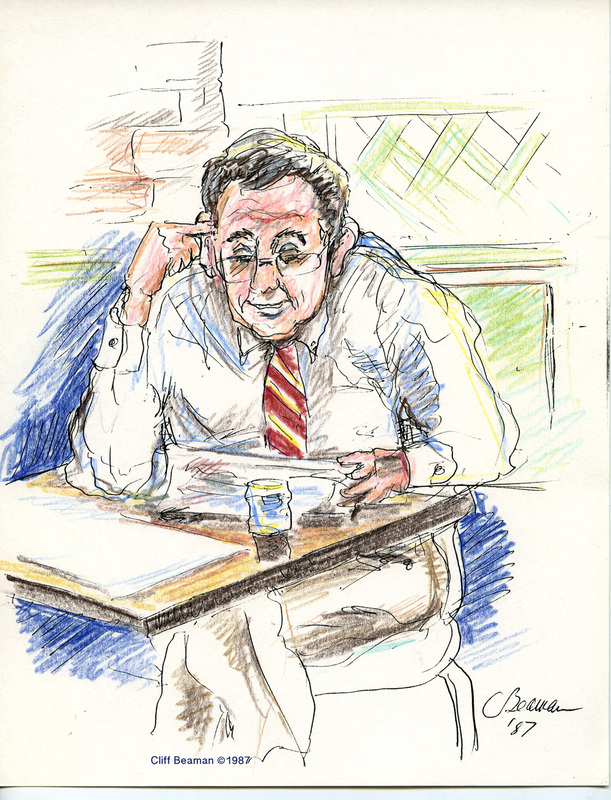 They are priceless, especially the sketches of unsuspecting ordinary people in restaurants. This post actually served two purposes: provided an update on the status of our moving & settling in + goaded Cliff to digitize more art, a huge item on his to-do list for years. And years. 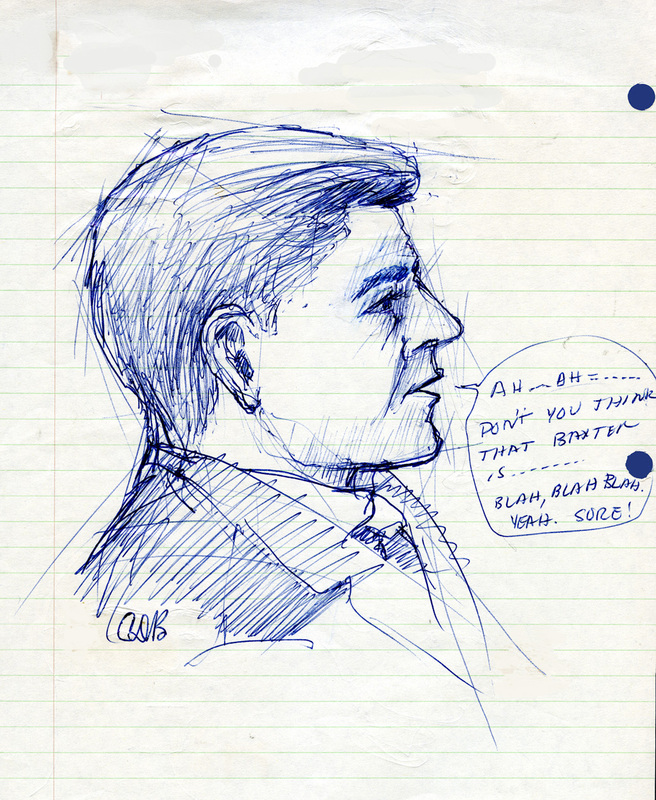 He has some sketches of his professors saved – doodling seemed more important to him than taking notes in philosophy class, he said. Those will have to wait. (He may have to find them first!) 🙂 Thanks, Kathy! I have always been a doodler myself and one of my hopes is to live long enough to make art a passion in my life. So I LOVE these finds, especially, like Merril above, do I enjoy the candid portraits of unsuspecting restaurant goers. Wish I was sitting at one of those tables. 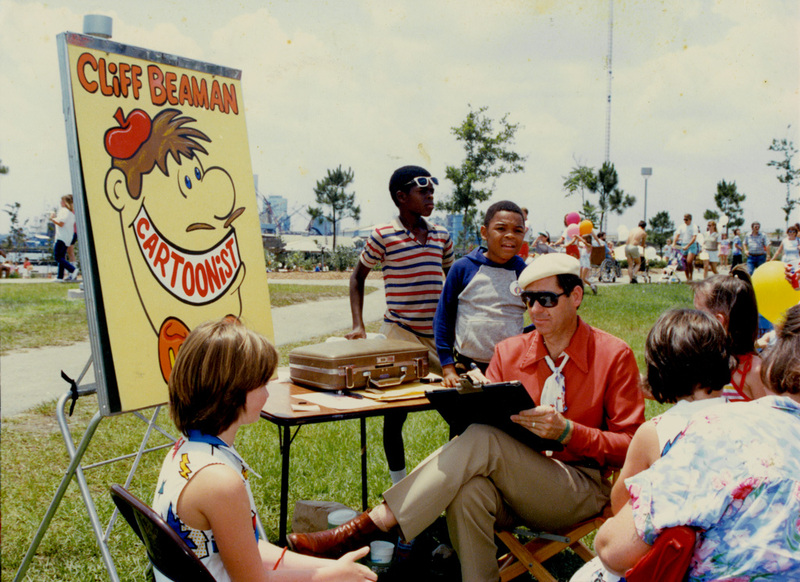 I’d love to have a Cliff Beaman original. You and Cliff have accomplished so much all through your lives and in the last six months as you have moved. Congratulations. These “finds” are well deserved treasures. Oh, and thanks for the shout out for Magical Memoir Moments! I’ve noticed some cross-pollination between our blogs over the years. Just recently I’ve befriended one of your recent acquaintances at the Abbey, someone who is enthusiastic about bees. Here’s to more . . . Thank you ladies for all of your kind comments. Beyond these samplings I’ve discovered a lot more sketches . . . maybe in a future time The Plain and Fancy Girl Marian will share some, especially if it can tie in with her current theme. Marian (and Cliff), this is a delightful post! 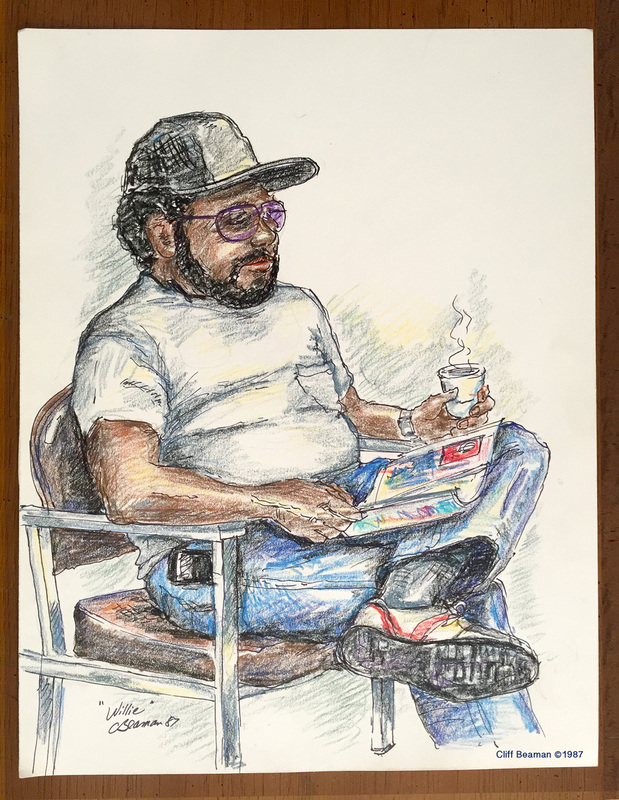 When Jim and I retired after teaching for more than 30 years each, a former student did caricature cartoons of us each in retirement, and they were poignant, funny, and accurate. Art–and artists–add a wonderful dimension to our lives! I’m glad you enjoyed the post. I know you and Jim are both English teachers but I had no idea you amassed more than 60 years between you. Maybe, just maybe, the caricatures will appear on a future post. Maybe they have already posted them and we were not online friends at the time. Thank you, Marylin. Finding a treasure trove of wonderful hidden artwork like Cliff’s is like hitting the proverbial jackpot; he’s got to be on cloud 9! I love the first photograph best, the one with beret-topped Cliff surrounded by totally captivated onlookers. And while I haven’t used my own photographs as writing prompts, I have purchased a few old postcards in antique stores and used them as writing prompts for fiction. It’s fun to fabricate an entire story from a postmark and a few sentences. I like your idea of postcards as writing prompts. You’ll see a few antique ones in a Hallowe’en post at the end of October. Maybe some more “flash fiction” will emerge. Thanks for the comment here and the tweet over “there,” Laurie. Marian — “Hallowe’en post at the end of October.” You carrot dangler, you! A talented and creative man that husband of yours is, Marian. What a delight! Glad you enjoyed this, an artist yourself, Linda. More to come . . . maybe, he says. A delight! Thanks Marian & Cliff for this portrayal of treasures in amongst the stuff! I just opened one of the drawers in my study, now this minute. The first one I see is a very nice one of me, in black with a pretty scarf, short hair, sunglasses, raising a bottle of bubbly to my lips – (and waving a cigarette in my left hand …). The occasion I think must have been my 50th birthday ..(when Moses was a boy). You always write such detailed and meaningful comments – often with wry humor. Photo prompts would be a snap for you as your graphic description above proves. I’ll pass the compliment on to Cliff. Thank you, Susan. It’s a pleasure sharing these, Fiona! Wow Marian, your hubby is a fantastic artist. Does his work involve his art or is it a hobby? Maybe some should be framed and sold at art fairs? I love how photos can link generations – the anecdote of your grandniece proves how sweet it is. Awww – I’d love to have seen her expression. 🙂 I’m not surprised you have mounds of photos either, appreciating nostalgia as you do. After a few years teaching, he’s devoted his life to commercial art, cartooning, or fine art painting; it’s never been just a hobby. Most of the paintings on our walls are originals – thanks to him. He’s written several children’s books and we’re discussing how to market them. Thanks for asking. I’ll make sure to pass your compliment on to him. Thanks for tweeting this, so thoughtful, Debby! It’s so amazing what you uncover , particularly when you haven’t the time to search . I love your husband’s art work you must be very pround . Hey ! It must be one of the things you fell in love with , I am sure . Yes, he drew me in (pardon the pun!) with his art. The first thing I remember after meeting Cliff was his drawing a Santa Claus on a chalk board. I was mesmerized . . . and the rest is history. How lucky that you live so close to the beach. We live about 15 miles from Jacksonville Beach, where the water is still warm. Your secret’s safe with me, Cherry! My brother is 12 years younger than I am. Wow, Marian. You found an A+ husband and artistic eye in Cliff. No wonder you fell in love with him. I’m digging through boxes I haven’t opened for 30 years, perhaps 40 years. Because of visitors, I stalled the last few weeks. Now I’m waiting for my son to arrive tomorrow so he can help me move a few dressers around–putting an ugly old clunker in a closet for orderly storage there and moving an antique secretary into a more prominent place. With that dresser in a big walk-in closet, I’ll load the drawers with some of the precious things I’m finding. I’ll also take photos or scan a few things such as paperwork from a Quaker anti-Vietnam War protest and draft resistance documents that include Vic’s and my names. I found drawings Vic did when he was a kid. One says in his child handwriting, “Victor is 6.” It’s poignant to imagine that little boy, but also funny. In Vic’s last year, a therapist friend and I persuaded him to sit with us and draw a few of his most powerful dreams. In 60 years, his stick figure drawing style hadn’t changed a bit. Your system is methodical, like you, Elaine. I have always liked the idea of pushing old dressers into closets. It’s a functional way of re-purposing an item we may think of as ugly and making space for the beautiful, just like we do with our lives – ha! I think you could do a side by side of Vic’s drawings at 6 and then at 60. I don’t know what, but I can visualize it happening, perhaps on your blog. Love the photo of your homestead painting which then also accentuates all the differing patterns in the men’s attire. Small checkered pants, bold checked autumn colours shirt and again autumnal tones variegated stripe T shirt….our son then about 4 had similar style checkered pants. I had an instant flash back to them…amazing thing memory jolts! Thanks for sharing such memories. The only problem going through old photos is that some hours disappear. The photo of my dad in checkered slacks made me smile too. He never followed fads and spent his workweek in black mole-skin pants. I’m sure my mother bought these. I love how you refer to memory flashbacks as jolts and so they are. So much art, so little time… Thanks for sharing his work! You’re welcome, Rebecca. Thanks for your observation too. I love that first photo. And all those colorful caught restaurant images. If I was an artist who trafficked in pencils and brushes, I would do that! A delightful post. I know you are artistic too. It shows on your blog posts. I wonder how your memoir draft is coming along. All the best in this unique journey, Luci! I have a lot of work cut out for me yet in the writing of the memoir, but it is coming. I say this happily after feeling stymied for a couple of weeks from being able to produce anything at all. Two steps forward and one step back. That’s how the work of writing proceeds – in my case too. What lovely finds. He really is very talented. Once upon a time I used to draw but I doubt there is anything of mine left about and certainly not nearly as good. Thanks for the compliment. I’ll pass it on, Marie. If you find some of your own art, your kids (and later grandkids) may be interested in seeing it. I have one or two pieces. They’re not very good in my estimation; still they’re part of my history.